Research!America has been gauging public opinion on research to improve health since 1992, and our publications get the word out about advocacy initiatives, the day’s top issues, the importance of continued research and more. Source: A Research!America survey of U.S. adults conducted in partnership with Zogby Analytics in January 2018. For our latest polls, click here. Research!America annually publishes a summary of results from our most recent public opinion surveys. Use this data in letters to the editor; op-eds; newspaper articles; letters to and visits with elected officials; speeches; talking points; congressional testimony; town hall meetings and debates; and policy statements. 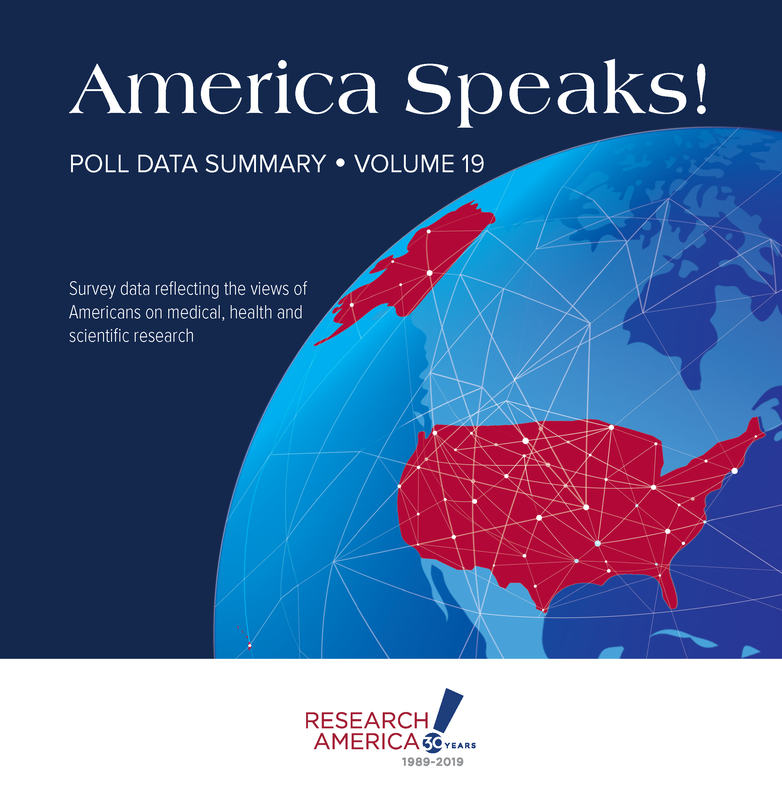 America Speaks: Poll Data Summary, Volume 19 was published in March 2019. Research!America's annual report is a look back at our accomplishments of the previous year, released at our annual meeting each March. 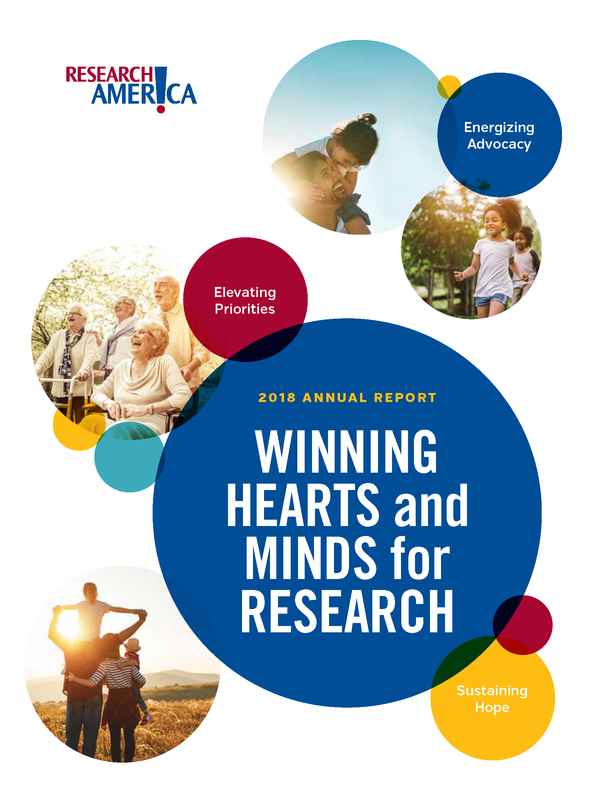 Our 2018 report is Winning Hearts and Minds for Research. A new report from Research!America shows total U.S. investment in medical and health R&D grew by 27% from 2013 to 2017, led by industry and the federal government. Academic and other research institutions ramped up their R&D investment substantially over the five-year period, increasing their spending by 27%, while state and local governments increased investments by 17.5%. Despite overall investment growth, medical and health R&D continues to account for just five percent of the total $3.6 trillion in U.S. health spending. Our award-winning newsletter, The Research Advocate, features articles about advocacy initiatives, research funding, research in the news and news from members. Browse selected articles. See our newsletter archive to download the latest and past issues in PDF format. 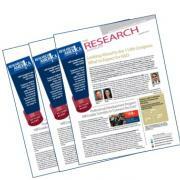 To download issues prior to September 2009, please contact us at editor@researchamerica.org. 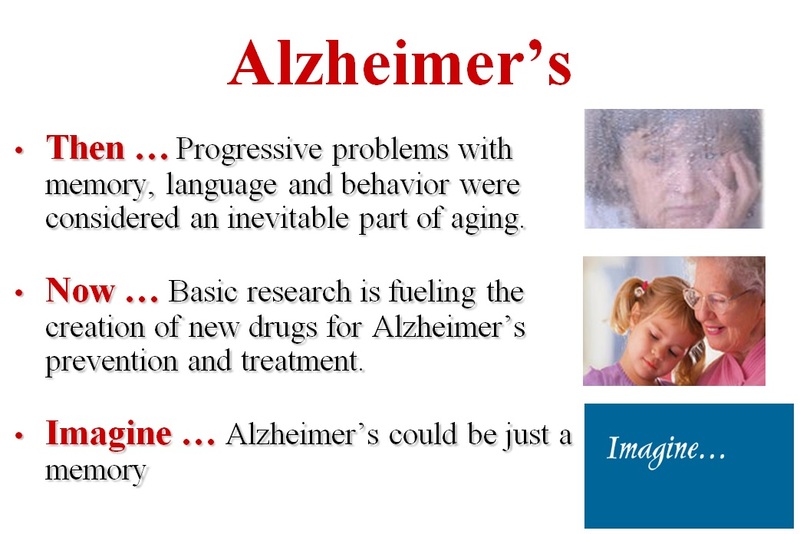 Research!America's Then-Now-Imagine messages describe the state of a condition or disease years ago (then), how research has improved the situation (now) and what further research might bring in the future (imagine). Research!America has many years of experience gauging public opinion on health research. See a comprehensive list of the state and national polls we have commissioned since 1992. For more information on our public opinion polling, please contact us at programs@researchamerica.org.